This scarf was made by cutting a piece of prefelt to a size slightly smaller than the width and length of the habotai scarf. 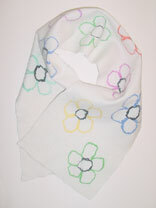 The prefelt is placed on top of the scarf stretching slightly to fit the width of the scarf. Next the scarf and prefelt were wet down. Then the design was created with silk sliver. The project was wet before positioning the silk sliver to help keep the silk sliver in place while working. The scarf was felted with a sander just enough so that the silk sliver design would stay in position and the silk scarf and prefelt start to stick together. Then the project was felted and fulled in a washing machine, and finished by rubbing while flat on a rolling mat. Finished size: ~ 11" x 49"